A facile co-precipitation method was developed to prepare the novel metalloporphyrins-Ba2+ composites with ca. 3 μm diameter and olive-like morphology. Olefins epoxidation reactions were employed to investigate their catalytic performance. 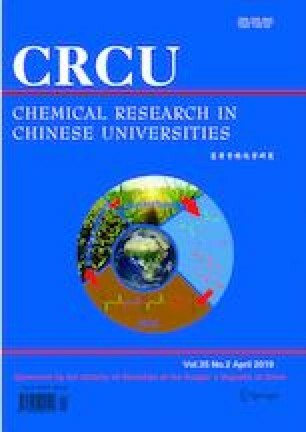 Compared with the free metalloporphyrins, the composites exhibited not only the improved stability and recyclability, but also the enhanced catalytic activity. Such catalytic behaviors could be related to the unique structure of the composites, e.g., the strong interaction between R-SO3- and Ba2+ ions and the uniform distribution of metalloporphyrins on the catalyst surface, respectively. Furthermore, the composites showed good compatibility with a wide range of substrates. The well-designed composites are expected to be efficient catalysts, alternative to many sophisticated-synthesized metalloporphrins-based materials, in the industrially important reactions. Supported by the National Natural Science Foundation of China(Nos.21606260, 21576302, 21376278), the National Science Foundation for Distinguished Young Scholars of China(No.21425627), the Natural Science Foundation of Guangdong Province, China(No.2015A030313104), the Fundamental Research Funds for the Central Universities from Sun Yat-sen University, China(Nos.15lgjc33, 16lgpy15), and the Features Innovative Projects of Department of Education of Guangdong Province, China(No.2016KTSCX003). Supplementary material is available for this article at https://doi.org/10.1007/s40242-019-8348-6 and is accessible for authorized users.